Except for the brief interlude of high modernism, when we were encouraged to spend all our time in the studio and leave the rest to the professionals, artists have usually also been other things: architects, poets, scientists, thieves, diplomats. In his prime, Jacques-Louis David managed—between paintings—to dismantle the French Royal Academy, art-direct Voltaire’s lavish funeral, and help arrange several high-profile executions during the Reign of Terror, before they threw him in jail. So we shouldn’t be too impressed with ourselves when we curate a show or write an essay. 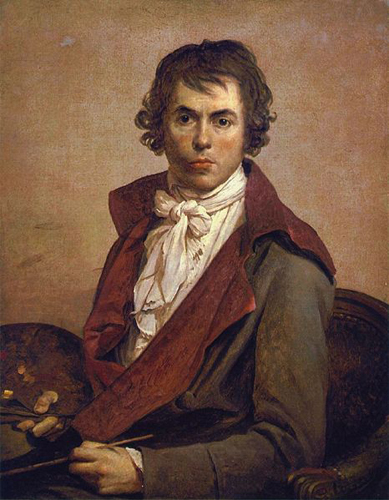 Jacques-Louis David, Self Portrait, 1794. And yet here we are. Having foresworn the isolated studio and its self-reflexive entrenchment of competence, the artist of the decentered practice triumphantly re-enters the world. But, as he quickly discovers, this world has long since been divided into discrete and impenetrable domains of expertise. Encountering the highly evolved vocabulary that envelops everything from aerodynamics and philosophy to grant writing and non-profit law, the artist of the decentered practice sees he can no longer be a Renaissance man. More than likely, he will become a kind of universal amateur instead. This can be both good and bad. Sometimes it’s productive to let those with no formal training visit a discipline and rearrange the conceptual furniture; some people are truly useful in several fields. And certain fields are more open to our interventions; artists would nowadays find it very difficult to advance the course of science, but we have a much easier time opening a gallery or starting a magazine. The downside is that the artist-as-amateur spends endless hours playing catch-up to the rules and procedures of other practices, often finding himself unable to do more than footnote contributions from the establishment. And the tedium of dilletantism is self-evident to anyone who has sat through a mediocre screening, lecture, or social experiment whose only supposedly interesting feature was its presentation as art. It’s like being asked to be impressed that someone drew a passable picture of a dog using his left hand. Which leads us back to the studio. When people talk about the decentered practice, they often ascribe to it an inherent progressivism, and to the still-centered one, an embarrassing atavism — as if the artist who curates exhibitions, produces films, and collaborates on texts with economists has moved conceptually, politically, and even morally beyond the artist who still mucks around with objects and then tries to sell them. But it’s naive to presume that the contemporary artist’s tangled affair with the culture industry is left behind at the studio door, or that activities embarked upon outside one’s specialty — or outside one’s gallery — are necessarily altruistic. What’s more convenient for the culture industry, anyway, than a producer who operates in different fields at once — synergistically, as they say? What smells worse than the artist who seeks to evade the specter of marketing by branding himself? 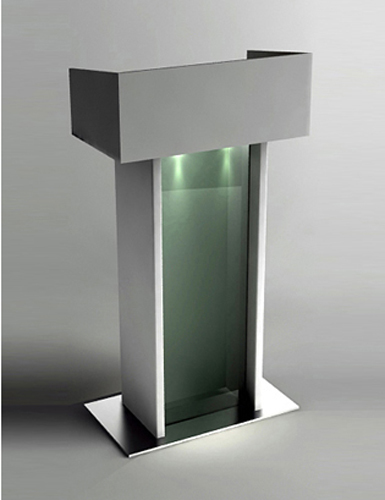 53 Degrees Design, Lectern 04. We find the decentered practice works best when it doesn’t draw too much attention to itself. Soaked too long in theory, it tends towards a convoluted formalism, turning potentially useful actions into blank, self-conscious examples of themselves. In practice, however, there are countless good reasons for an artist to do other things occasionally, or even primarily. So even if someone wants to open a bar as an artwork, you can still get a drink. And if another artist has to bartend anonymously just to pay the bills, then make it a double. This seems to be the point, really: what artists do collectively, or for money, or for kicks, all serves to mitigate what is still usually a badly paid, solitary, and potentially monotonous vocation. For anyone who feels boxed in by the traditional role of the artist, these decentered activities begin to revise the job description. For those who feel excluded from the sacred rooms of art, writing an essay, curating a show, or starting a gallery can all serve to jimmy the door open. Given their usefulness, it’s no surprise that these various practices, seen as radical and groundbreaking in the last century, are now fairly commonplace: so much so that we’ve stopped thinking of them as decentered. In fact, the very notion seems nostalgic to us, harkening back to the days when there still was a center — held fast by painting and sculpture — and other practices were vying for legitimacy. As artists, we’ve long since won the right to do as we wish, so we don’t see the romance in reenacting previous transgressions. Whatever projects we take up now, their status as art or not-art — centered or decentered — matters less to us than what they actually do, whom they serve or entertain, what they reveal or revise, what feelings they evoke or dispel. At this point we’ve earned the right to see practices for what they are and take each of them on their own terms. So if an artist feels called upon to open a restaurant — well, you can either eat the food or not. And if they want to write essays instead — you can’t really stick a fork in those. Dushko Petrovich and Roger White are both painters. They also edit the print journal Paper Monument.